Dialog, Ideamart in collaboration with Google Developer Group Sri Lanka successfully hosted South East Asia’s largest Google I/O Extended 2018 event in Sri Lanka. 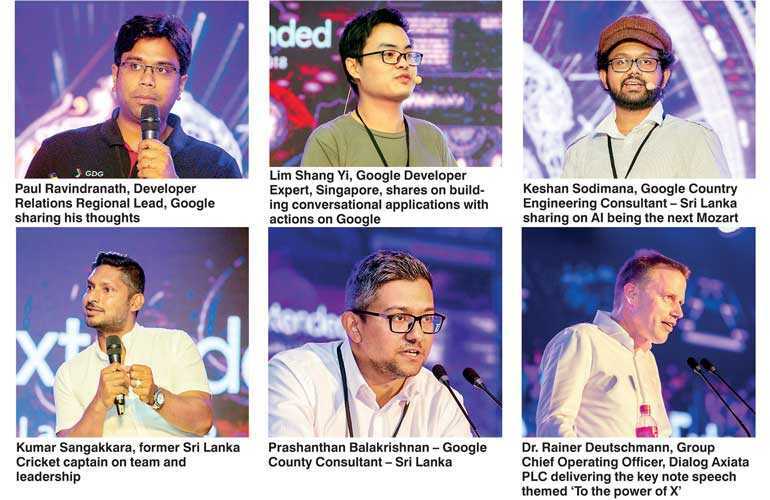 ‘Google I/O Extended Sri Lanka 2018’, Sri Lanka’s most anticipated tech event of the year, was opened by a keynote from Dialog Axiata PLC Group Chief Operating Officer Dr. Rainer Deutschmann and saw the likes of an esteemed panel of speakers from Google, Prashanthan Balakrishnan – Google County Consultant – Sri Lanka, Paul Ravindranath, Developer Relations Regional Lead, Google Inc., Keshan Sodimana, Country Engineering Consultant – Sri Lanka, Google Inc., Lim Shang Yi, Google Developer Expert, Singapore, Google Inc. and Richa Singh, Program Manager – Google Crowdsource, Google Inc, draw more than 3,500 innovators, entrepreneurs and agile developers to the fore. Vision 2022 by the Sri Lanka Association of Software and Service Companies’ (SLASSCOM) states that the Sri Lankan IT sector foresees it becoming a $ 5 billion industry, creating 200,000 direct jobs and enabling the launch of 1,000 startups. On the backdrop of such opportunity, the ICT and BPO sector grew 3x in exports and 2x in workforce over the last five years and the demand continuously needs to be met by an overpromise of talent in the country. Dialog Axiata PLC Group Chief Operating Officer Dr. Rainer Deutschmann outlined the tectonic shifts from centralised to decentralised and edge computing, facilitated by 5G and blockchain, from classical to quantum computing approaching the quantum supremacy, and from classical deep learning towards self-optimising and self-learning models. He stressed the associated responsibilities for everyone, looking for example at machine bias, where algorithms exhibit the bias of their creators or their input data. He argued, “We are living in an exponential world, which poses tremendous opportunities for everyone embracing abundance, life-long learning, constant reinvention, new technologies and tight networking amongst entrepreneurs.” He also extended an open invitation to capture those opportunities jointly with Dialog, for example through the Dialog Axiata Digital Innovation Fund, the Dialog startup and developer program, or directly leveraging Dialog’s leading telecommunication and digital services. IdeaMart Senior Manager – Long tail Business Roshanth Gardiarachch, and Google County Consultant – Sri Lanka Prashanthan Balakrishnan conducted a joint session on the power of eco systems. Other invitation speakers from Google, Lim Shang Yi, Google Developer Expert, Singapore, shared on building conversational applications with actions on Google, Keshan Sodimana, Google Country Engineering Consultant – Sri Lanka on if AI is the next Mozart and Richa Singh, Program Manager – Google Crowdsource on Google Crowdsource and Machine Intelligence. The event provided a platform for the budding developer and tech community to find inspiration and learn more about the opportunities and resources available for them to upskill and work in tandem with the likes of digital incubator companies through increased investment in supporting startups such as the Google Launchpad Accelerator. Kumar Sangakkara, former Sri Lanka Cricket captain and Peter De Almeida, Chief Executive Officer, N-Able shared key insights on managing teams and leadership pointers for developers and digital businesses to advance. The future of technology and IoT (Internet of Things) applications were centre focus with Dialog showcasing opportunities to enhance your everyday experiences through next generation technology. The Smart Home exhibit included a smart button, to be used as a general-purpose actuator for sending an SMS, an email, calling a taxi, switching on a light, ordering gas and multiple other repetitive tasks. The latest Orange Electric Smartsocket powered by Dialog can now be used in homes to remotely switch your electricity on/off using the Dialog Smartlife App. Other key features within the smart home exhibit were a motion detector that helps you create scenes, a temperature and humidity sensor that reports functions and executes actions accordingly and a door and window sensor that changes your everyday functions. 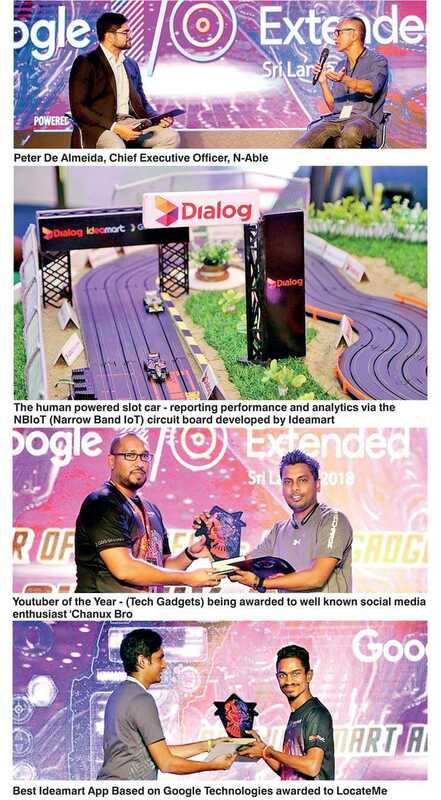 The key highlight was the human powered slot car, that used a racing car, a racing track and a gym bike to power the car and report performance and analytics via the NBIoT (Narrow Band IoT) circuit board developed by Ideamart, which is Sri Lanka’s first ever NB-IoT kit made for developers. Other exhibits included connected weather stations and a smart agriculture setup featuring a hydroponics station that used IoTto regulate plant growth through water and humidity exposure. The award categories provided a platform for tech personalities in their respective fields to be recognised at the large forum. Some of the award categories included, Youtuber of the Year (Tech Gadgets) awarded to well known social media enthusiast Chanux Bro, Sri Lankan Android App of the Year to Helakuru, Tech Startup of the Year to Arimac Lanka who continues to explore the possibilities of AI for the future, Best Ideamart App based on Google Technologies to LocateMe, Emerging Innovator of the Year clinched by Nuwan Jaliyagoda and a special place to encourage female participation in the community through Tech Startup Female Entrepreneur of the Year which was bagged by the promising Sajani Amarasiri. The award recipients were nominated by the community and selected based on the most amounts of votes received online, quality of the work and the significant impact they are making in the country. The event was a launch pad to many nascent, aspiring and mature tech individuals and an opportunity to network and share experiences with each other and Google, Dialog and Ideamart industry experts.